I knew I was in Australia when I noticed all the legs - men's legs! I never thought there could be so many variations: short, long, muscled, knobbly-kneed. Then there were the hairy ones ... Jaime Richards has spent most of her life in Pakistan and returning to Australia seems like another planet compared to the country she has left behind. Here in Australia, boys try to kiss her, men wear shorts and everyone says 'cool' all the time. How will she ever know the right things to say or do or wear? After all, this is meant to be her own culture. This is a story of living beyond borders, and discovering the gift of adapting to new cultures, especially one's own. 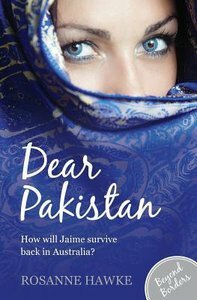 About "Dear Pakistan (#01 in Beyond Borders Series)"
Rosanne Hawke is an Australian author of over twenty books, among them Shahana, The Messenger Bird, winner of the 2013 Cornish Holyer an Gof award for YA literature, and Taj and the Great Camel Trek, winner of the 2012 Adelaide Festival Children's Literature Award . Her other books include Marrying Ameera and Soraya the Storyteller which was shortlisted in multiple Australian awards in 2006. Customer Reviews For "Dear Pakistan (#01 in Beyond Borders Series)"
Rosanne Hawke's years spent in Pakistan has given her a deep love and understanding of people from the Middle Eastern cultures. In this novel, Rosanne tells the story of a teenage girl, Australian by birth but having spent her formative years in Pakistan, and the struggles she faces when she re-enters a Western culture. Her missionary family returns to Adelaide after years in Pakistan, and Jamiee finds that while she knows she is not Pakistani, finds it difficult to adjust to the freeliberal behaviour of her Australian school friends. This story is an interesting study in multi-cultural ideas, and gives insight into what young people who have been brought to Australia must feel when trying to fit in. Australian teenager, Jaime Richards, returns to Pakistan. The old world charm is still there - the villages, the bazaars and the mysterious rugs - but Jaime no longer feels safe and confident in this new Pakistan. Taken at gunpoint into Afghanistan, Jaime and her friends are caught up in a shadowy secret world of intrigue and terrorism. Will they escape the Mujahideen fighting their holy war? Or will the wars within themselves consume them?